Home › Academy Awards › Ratatouille! “Dinner And A Movie” With Chef Thomas Keller’s Legendary Byaldi! 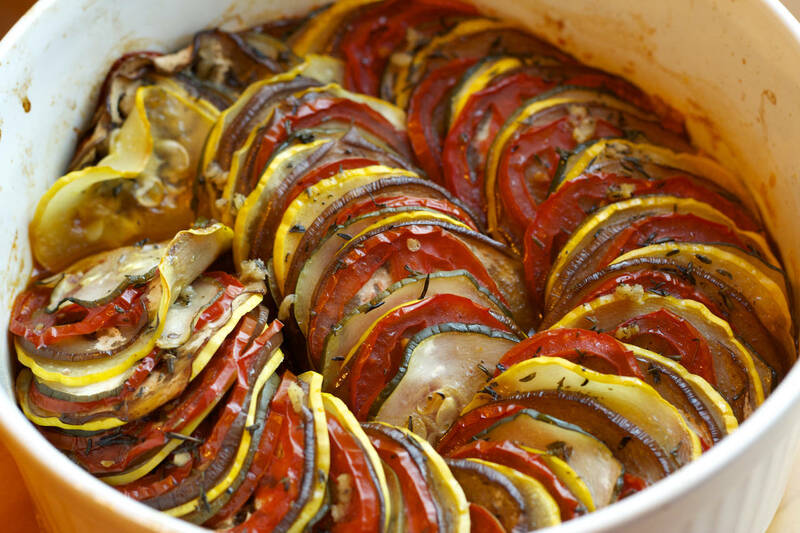 If you don’t know what this is, welcome to the delicious French world of a “Ratatouille” – and I assume you’ve heard of that film, where this recipe came from! Looks great, doesn’t it? 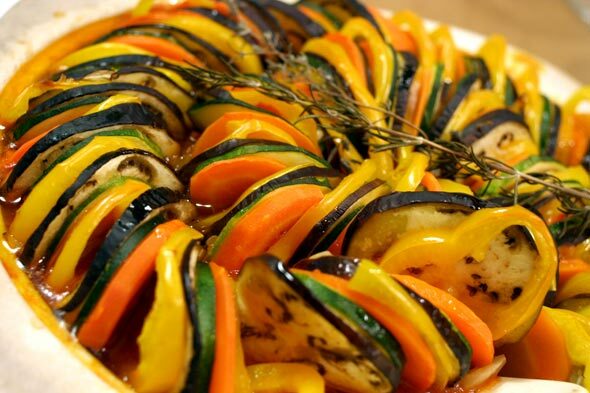 Ratatouille is a traditional baked french dish. Tomatoes are a key ingredient, with garlic, onions, courgette (zucchini), aubergine (eggplant), bell peppers, marjoram and basil, or bay leaf and thyme, or a mix of green herbs like herbes de Provence. 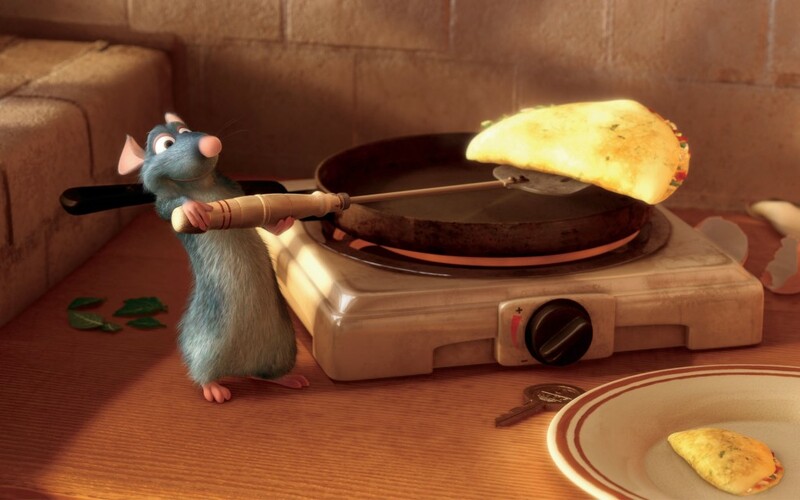 It’s not often that your favorite Chef is a rat, but how can you argue when it’s Remy! Remy is one of the greatest undiscovered chefs in Paris. And he’s a rat. Don’t hold that against him, because his love for food transcends his background. You have to give credit to Pixar for not only making a film about a rat, but for the amazing amount of attention to detail in the film as it relates to food. The terrific film-making team at Pixar wanted to accurately capture life inside a kitchen, so they reached out to America’s most celebrated Chef! Chef Thomas Killer And The French Laundry! Yes, we took a picture with Chef in his celebrated kitchen – the world famous “The French Laundry”, but we weren’t the only ones! The animation team for “Ratatouille” worked alongside Chef Thomas Keller at his acclaimed restaurant in Yountville California in order to learn the art of cooking. Mr. Keller also appears in a cameo role as the voice of a patron at Gusteau’s. This is a funny, touching animated movie that celebrates our love for food…so make yourself the Ratatouille recipe from the movie and pop it into the blu-ray! The recipe for Thomas Keller’s Confit Byaldi, the accordion-fanned version of ratatouille used in the movie is available on the French Laundry website, but buy the gorgeous cookbook as well…my friend Michael Ruhlman co-wrote it with him! So there you have it, another in my series of “Dinners and a movie”…did you see my story on this amazing meal? ‹ What Is “The Thing?” The Shocking Mystery Of Arizona’s Desert Is Revealed Here! My Road Trip Across America Pt. 2! Three of my favorite movies; Ratatouille, The Big Night and Goodfellas. I have a couple of movie night traditions of my own. Any one of The Godfather movies with pizza and Chianti. The Natural with a couple of hot dogs and beer – my wife can’t get into this one. Nice post and interesting site. Thanks for the comment – that’s a great idea for “The Natural” – my wife LOVES that film! Have you seen the director’s cut of The Natural and have you read the book by Bernard Malamud? I recommend both. Ah, that’s one of my favorite kids’ movies of all time! And the recipe looks wonderful. Thank you! The film is charming, and the message in it so good: inclusion, don’t judge a book by its cover….and the dish is great and fairly easy! I love the movie Ratatouille, John. I am also a fan of the dish which my mom used to make for me. Yes, I have been doing that. I LOOOOVE this dish! I have made something really similar a few times…although I often add some mozzarella on the top. It’s less healthy, but I love the contast of creamy cheese with the deep flavours of the veggies! I quite like to use a couple of different colours of tomatoes and courgettes to make it even more rainbow like. Yes, you can cheese it up, because mozzarella goes so well with zucchini! Thanks for the comment! Pete, it’s a charming film, but if you are “off” courgettes, it might not be palatable to you! Excellent post, John. My granddaughter and I watched this recently (again). The story is cute but it’s the Michael Giacchino score that I long remember. 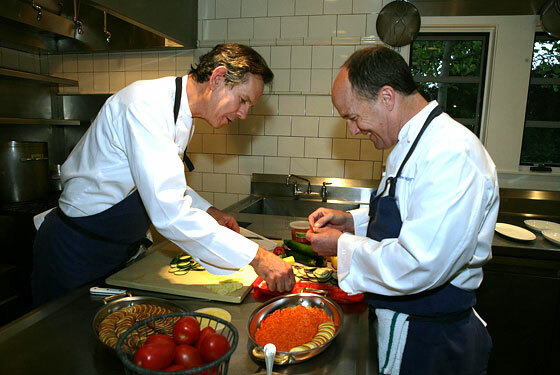 The dish, your recipe, and experience with Chef Keller is impressive. 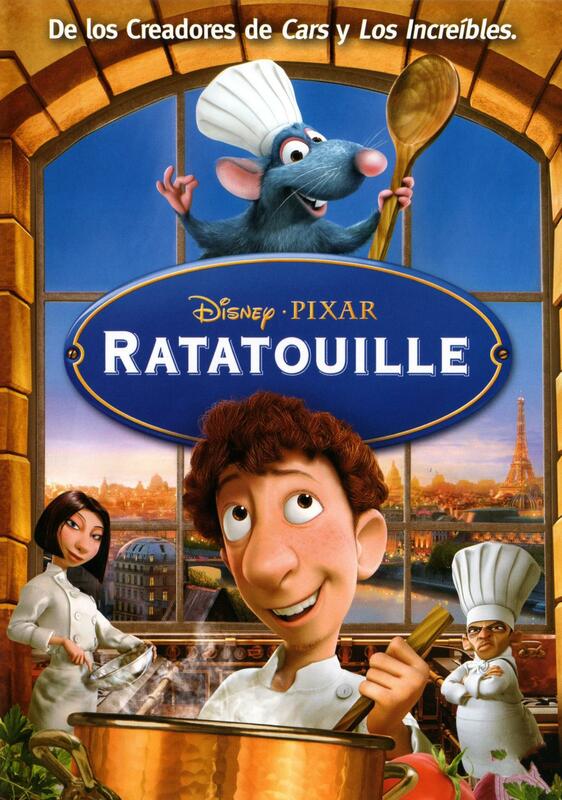 I love the movie Ratatouille, but not the dish. Blech on the zucchini and squash! Ha! I am not an eggplant fan, but I find if I slice it thin enough and surround it with more veggies, it works for me…this is a great dish underneath or alongside lamb…and even if you don’t like the dish, I agree the film is terrific! Thanks for the comment! Ha. There is no amount of thin that will make eggplant ok for me. My husband is a chef and he’s tried. I just can’t get past the texture of it. Found your blog through Gin and Lemonade’s blog party. 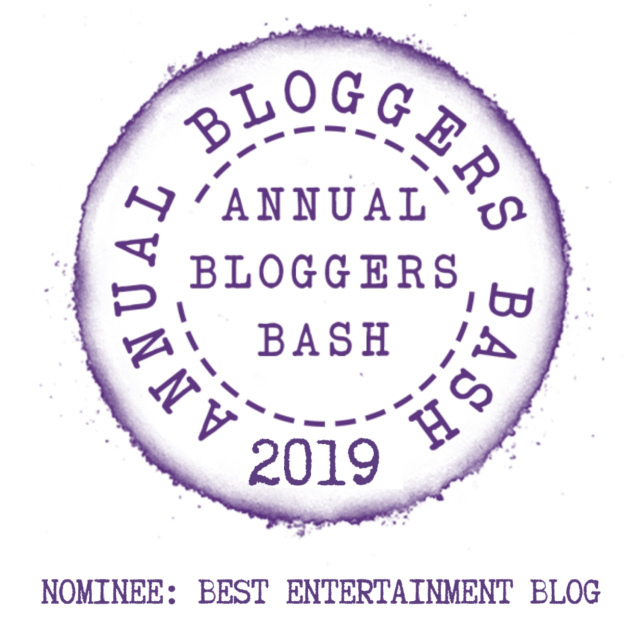 Thanks – I will head over to your blog as well!